Auditory processing is the basis of speech and music-related processing. Transcranial Magnetic Stimulation (TMS) has been used successfully to study cognitive, sensory and motor systems but has rarely been applied to audition. Here we investigated TMS combined with functional Magnetic Resonance Imaging to understand the functional organization of auditory cortex. Andoh, J., Zatorre, R. J. Mapping the After-effects of Theta Burst Stimulation on the Human Auditory Cortex with Functional Imaging. J. Vis. Exp. (67), e3985, doi:10.3791/3985 (2012). Auditory cortex pertains to the processing of sound, which is at the basis of speech or music-related processing1. However, despite considerable recent progress, the functional properties and lateralization of the human auditory cortex are far from being fully understood. Transcranial Magnetic Stimulation (TMS) is a non-invasive technique that can transiently or lastingly modulate cortical excitability via the application of localized magnetic field pulses, and represents a unique method of exploring plasticity and connectivity. It has only recently begun to be applied to understand auditory cortical function 2. An important issue in using TMS is that the physiological consequences of the stimulation are difficult to establish. Although many TMS studies make the implicit assumption that the area targeted by the coil is the area affected, this need not be the case, particularly for complex cognitive functions which depend on interactions across many brain regions 3. One solution to this problem is to combine TMS with functional Magnetic resonance imaging (fMRI). The idea here is that fMRI will provide an index of changes in brain activity associated with TMS. Thus, fMRI would give an independent means of assessing which areas are affected by TMS and how they are modulated 4. In addition, fMRI allows the assessment of functional connectivity, which represents a measure of the temporal coupling between distant regions. It can thus be useful not only to measure the net activity modulation induced by TMS in given locations, but also the degree to which the network properties are affected by TMS, via any observed changes in functional connectivity. Different approaches exist to combine TMS and functional imaging according to the temporal order of the methods. Functional MRI can be applied before, during, after, or both before and after TMS. Recently, some studies interleaved TMS and fMRI in order to provide online mapping of the functional changes induced by TMS 5-7. However, this online combination has many technical problems, including the static artifacts resulting from the presence of the TMS coil in the scanner room, or the effects of TMS pulses on the process of MR image formation. But more importantly, the loud acoustic noise induced by TMS (increased compared with standard use because of the resonance of the scanner bore) and the increased TMS coil vibrations (caused by the strong mechanical forces due to the static magnetic field of the MR scanner) constitute a crucial problem when studying auditory processing. This is one reason why fMRI was carried out before and after TMS in the present study. Similar approaches have been used to target the motor cortex 8,9, premotor cortex 10, primary somatosensory cortex 11,12 and language-related areas 13, but so far no combined TMS-fMRI study has investigated the auditory cortex. The purpose of this article is to provide details concerning the protocol and considerations necessary to successfully combine these two neuroscientific tools to investigate auditory processing. Previously we showed that repetitive TMS (rTMS) at high and low frequencies (resp. 10 Hz and 1 Hz) applied over the auditory cortex modulated response time (RT) in a melody discrimination task 2. We also showed that RT modulation was correlated with functional connectivity in the auditory network assessed using fMRI: the higher the functional connectivity between left and right auditory cortices during task performance, the higher the facilitatory effect (i.e. decreased RT) observed with rTMS. However those findings were mainly correlational, as fMRI was performed before rTMS. Here, fMRI was carried out before and immediately after TMS to provide direct measures of the functional organization of the auditory cortex, and more specifically of the plastic reorganization of the auditory neural network occurring after the neural intervention provided by TMS. Combined fMRI and TMS applied over the auditory cortex should enable a better understanding of brain mechanisms of auditory processing, providing physiological information about functional effects of TMS. This knowledge could be useful for many cognitive neuroscience applications, as well as for optimizing therapeutic applications of TMS, particularly in auditory-related disorders. The protocol is divided in a two-day session (not necessarily consecutive). The first day consists of an fMRI localizer composed with an anatomical and a functional MR scans to define for each participant the areas to be targeted with TMS. The second day consists in the fMRI sessions pre- and post-TMS where TMS is applied inside the scanner using a special MR compatible TMS coil (Magstim Ltd., Wales, UK) and a frameless stereotactic system (Brainsight). The latter is used to position in real-time the TMS coil on cortical areas relative to each participant's anatomical and functional data. Start with acquiring a high-resolution anatomical image of your participant. Then, acquire functional images using a gradient echo EPI pulse and a sparse sampling paradigm in order to minimize any BOLD effect or auditory masking due to MRI scanning noise 14,15. In our case, fMRI is carried out during a melody task in which participants have to determine if two consecutive 5-note melodies are the same or different 2,16. A nondiscrimination auditory control task is also included, in which subjects hear two equal-length patterns of five notes, all at the same pitch of C5 and are instructed to click the left button following the second stimulus. Periods of silence are also inserted randomly among the task trials in each run. In total, 72 trials are presented in a randomized order: 24 trials of melody discrimination, 24 auditory control trials and 24 periods of silence, for a total duration of 12 min 16 sec. Define the stimulation site using anatomical and/or functional landmarks. One has to be aware that TMS is limited regarding the depth of the stimulation site because of the attenuation of the electric field strength in depth, and cannot expect to reach areas deeper than 3 cm6,17 . A crucial step is to use similar landmarks for each participant, which could be difficult because of the differences in anatomy and function between participants. Here, we target Heschl's gyrus in each participant, located using both anatomical and functional landmarks. We use masks of Heschl's gyrus provided by the Harvard-Oxford structural atlases (http://www.fmrib.ox.ac.uk/fsl/data/atlas-descriptions.html) and the TMS target is defined individually by the peak of activation within the Heschl's gyrus 2. In addition, we also define the vertex position, which will be used as a control site to control for non-specific effects of TMS such as acoustic and somatosensory artifacts. The vertex is defined anatomically as a point midway between the inion and the bridge of the nose, and equidistant from the right and left intertragal notches. The order of site of stimulation (i.e. Heschl's gyrus or vertex) is counterbalanced across individuals. Prepare the participant to go directly in the scanner. This includes removal of metal and filling the TMS and MR screening form. Start the MR acquisition with an anatomical and a functional scans (identical to the one carried out in the localizer session, see section 1). The frameless stereotaxy system is composed of an infrared camera (Polaris Spectra), some tools and trackers (Brainsight) used for the registration procedure and a computer. The computer is located outside of the scanner room, but positioned at the entrance of the scanner room and the scanner door is kept opened during the TMS application. The tools and trackers are MR compatible, as well as the tripod (home-made) supporting the infrared camera and are therefore used inside the scanner room. The infrared camera is not MR-compatible, and therefore is positioned inside the scanner room, near the scanner door at approximately two meters from the scanner bed (see discussion for safety procedure). The TMS stimulator system is located in a room adjacent to the MRI scanner room. We use an MRI compatible TMS coil located inside the scanner room and connected to the TMS system via a 7-m cable through an RF filter tube. Load your participant's anatomical and functional images and the stimulation targets into the stereotactic software package (e.g. Brainsight). Here, we will be targeting the right Heschl's gyrus. After the pre-TMS fMRI acquisition, remove the upper MR head coil part of the 32-channel head coil (if using the Siemens 3T scanner and the 32-channel head coil configuration). Next, slide down the participant on the scanner bed. Fix the headband and tracker set on the participant's head. Mount the multi-jointed arm to the scanner bed and fix the MR compatible TMS coil onto the arm. Verify that all the trackers and the coil are in the field of view of the camera. Here, the camera is slightly moved to the right side of the participant to enable an easier tracking of the coil displacements when targeting the right hemisphere. Calibrate your subject's head with the stereotaxy tools (i.e. pointer tool). This is done by coregistering several landmarks on the participant's head (e.g. in our case the tip of the nose, the nasion and the tragus of both ears) with the same landmarks on the anatomical data. In this procedure, two experimenters are needed, one close to the participant's head to position the pointer tool on the participant's head, and the other experimenter at the entrance of the scanner room to perform the registration on the computer. Position the MR compatible TMS coil tangential to the scalp, and the coil trackers directed towards the infrared camera. The coil is oriented with the coil handle pointing backward and parallel to the midline 2. Fix the coil position using the screws on the multi-jointed arm. In the room adjacent to the MRI scanner, turn on the TMS system and begin stimulation. TMS is applied following a patterned protocol, i.e., continuous theta burst stimulation (cTBS) consisting in 3 pulses at 50Hz, repeated at 5Hz for 40s. We use a fixed stimulation intensity (41%) defined by the stimulator output 18,19. We chose this protocol as it has been shown to modulate cortical plasticity for a duration up to 30 min after stimulation cessation in healthy populations 20, (see discussion section for safety procedure). Once stimulation is complete, it is important to get the subject back into the scanner as soon as possible. Remove the TMS coil from the scanner room, and remove the multi-jointed arm. Slide back the participant's head into the MR head coil. Ensure your scanner is prepared and ready to go. Our advice is to keep the body platform raised during the whole TMS session, and reduce the number and duration of localizer scans to a minimum. Because the effects of rTMS are transitory, the final scanning session should begin with the functional scan. Again, we conducted fMRI during a 12-min run of the melody task. After the final scan is complete, finish with an anatomical scan. Analyses of fMRI data are conducted separately for both the pre- and post-TMS fMRI session. For each fMRI session (i.e., pre and post-TMS), the contrast between the melodies and the auditory control task shows task-related activity in the left and right Heschl's gyri, superior temporal gyri, inferior frontal gyri and precentral gyri (Figure 1 A, B). To evaluate differences between pre- and post-TMS fMRI sessions, we perform a random-effect analysis using Student's paired t-test. Significance is determined using clusters identified by a z > 2 threshold and a corrected cluster threshold of p = 0.05. Figure 1 C represents the contrast post- minus pre-cTBS for a single participant. The data suggest that cTBS targeting the right Heschl's gyrus (black circle) induces an increase in fMRI response in the contralateral (left) auditory cortex, including the left Heschl's gyrus. Changes in fMRI response are also found in the left postcentral gyrus, left insula, and in the lateral occipital cortex bilaterally. However, no significant change in fMRI response is seen under the coil. In addition, similar combined TMS-fMRI protocol is repeated to stimulate the vertex (control site). Comparison of pre- and post-fMRI sessions with cTBS applied over the vertex did not show any significant effect (data not shown). Figure 1. Analysis of individual pre-TMS fMRI data (A), post-TMS fMRI data (B) and post- minus pre-TMS fMRI data (C). A. Results of the contrast melody discrimination minus auditory control trials for a single participant in the pre-TMS fMRI session (A) and in the post-TMS fMRI session (B). From left to right: axial, coronal and sagittal views. In both (A) and (B), the TMS coil is targeting the right Heschl's gyrus (black circle) located at x=54, y=-13, z=1 (MNI152 standard space). For both pre- and post-TMS fMRI sessions, coordinates are displayed at x=-54, y=-13, z=1 (MNI152 standard space) to show changes in the left hemisphere at the site of stimulation (i.e. right Heschl's gyrus). C. Results of the contrast post- minus pre-TMS fMRI sessions using Student's paired t-test. We describe a protocol combining offline TMS and fMRI to investigate the functional organization of the auditory cortex. In the next sections, we will discuss the methodological factors to consider when conducting such approach. It is crucial to acquire an MR anatomical scan before and after TMS in order to get a robust registration between the two functional scans. Otherwise, the functional differences obtained could be due do misregistration issues between the two functional scans rather than to TMS-induced changes in fMRI signal. In addition, before any fMRI-TMS session (even before the fMRI localizer session), it is crucial to evaluate the stability and repeatability of the fMRI signal, to allow for quantitative comparisons of fMRI response magnitudes. In fact it could be a good idea to run some pilot studies, repeating the scans after removing and reintroducing the subject (without TMS) to test the degree to which one may expect differences due to this factor alone. The between-session comparison could be affected by non-specific TMS factors such as habituation to the MRI experiment context, including the MRI environment, as well as the task to be performed 21. To overcome this problem one could counterbalance the order of pre- and post-TMS fMRI sessions across participants. For example, one could start with TMS and then carry out a post-TMS fMRI session, then wait a couple of hours (or days), and perform the pre-TMS fMRI session. Such design depends on the expected duration of the TMS effects and practical considerations such as the availability of the subject and of the MR scanner. Another approach is to use sham or placebo stimulations, however their use is still debated as they may not provide the same acoustic and somatosensory sensations (e.g. muscles twitches) as a real stimulation and sham TMS has been shown to have similar effects as a real stimulation 22-24. A further approach is to apply TMS on several areas and evaluate the differences across sites; this comparison assumes that the nonspecific effects of TMS are equivalent across sites 24. For example, the vertex can be used to control for acoustic and somatosensory artifacts that accompany TMS as we have shown here. Because the effects of rTMS are transitory, it is important to get the subject back into the scanner as soon as possible after the end of TMS. For this reason, we used an MRI-compatible TMS coil and applied TMS when the participant was lying down on the scanner bed. But if this equipment is not available, it is also possible to apply TMS outside of the scanner room 13. However this requires more time as the participant has to leave the scanner room, and one cannot preclude secondary effects induced by motion and interaction with the experimenters. Keep the platform raised during TMS and ensure the stimuli are loaded before TMS is completed. A minimum of two researchers should be present, one responsible for the TMS session, the other one responsible for the MRI session. During the transition from TMS to the post-fMRI session, it is important to make sure that the participants are aware that they should interact with the experimenters as little as possible. The duration of the TMS post-fMRI scan is crucial and should be scheduled relative the duration of the rTMS-induced effects. It might be also interesting to carry out multiple post-TMS fMRI sessions at regular intervals after the end of the rTMS in order to map the rTMS-induced effects over time 12. Combination of TMS and fMRI can be used to target any cortical area in the prefrontal, frontal, temporal or parietal cortices. The main constraint is that the targeted area should be accessible to the TMS coil when the participant is lying down on the scanner bed, therefore posterior/occipital areas may not be accessible. The participant can also sit on the scanner bed during TMS, but in this case, the use of neuronavigation, especially the infrared camera will limit access to occipital areas for TMS. Another limitation to apply TMS when the participant is lying down on the scanner bed is the lack of flexibility of coil positions and orientations. For this reason, in our study, the TMS coil was positioned with the coil handle pointing backwards and parallel to the midline. In a previous study, we showed no significant difference of coil orientations when stimulating the auditory cortex 2. Another general limiting factor in TMS studies is the depth of the stimulated areas. It has been shown that TMS may not reach areas deeper than 3cm depth 6,17. Therefore, in our study, it is unlikely that rTMS induced changes in the medial portion of HG, the site of primary auditory cortex; conversely, HG extends all the way to the lateral edge of the superior temporal gyrus, and this area, which is thought to play a role in pitch processing 25,26 was very likely targeted by TMS. This consideration, of course, applies to all TMS studies. However, given the uncertainty about whether the TMS effect has reached its desired target, fMRI could help to determine objectively if such is the case or not. We used a cTBS protocol (50Hz), which has been so far always used outside a MR scanner room, therefore without MR compatible equipment 20,27-29. This is the first study that applied cTBS inside MR environment using MR compatible TMS equipment. To implement such a protocol, it is important to be aware that this set-up effectively reduces TMS output intensities by approximately 20% due to the increased impedance of the extended MR-compatible cabling running from the stimulator to the coil 30. In addition, this output limitation could be more important for some countries (e.g. 115V power supply in Canada versus 230V power supply in Europe). Therefore, if you are using Magstim equipment, you may need to acquire an additional module (Rapid-2 Plus One Module) in order to increase the power of your system. Another limitation of combined TMS and fMRI involves the use of frameless stereotaxy inside the MR room, as the infrared camera needs to be positioned at a safe distance from the bore of the MR scanner, and should therefore be able to provide large measurement volume (> two meters). This is why we chose the Polaris spectra (NDI Polaris, http://www.ndigital.com/medical/polarisfamily.php) providing a field of view up to three meters. There are also MR-compatible infrared cameras that could be used (e.g. MRC Systems GmbH, Germany). It is important to note that cTBS protocol may not be applied online during continuous fMRI acquisition. As we tested previously 31 and also by Bestmann et al. 32, a silent period of 90 ms is required after every TMS pulse to avoid artefacts on the MR images due to leakage currents through the TMS-coil during the recharge period of the stimulator. Continuous TBS is composed of trains of three pulses delivered at 50Hz (20 ms between pulses) separated by 200 ms, therefore unlikely to fit in an fMRI acquisition. In addition, cTBS is usually applied only during 40s (600 pulses), which does not permit many repetitions of EPI sequences. Continuous TBS protocol is also very noisy which should result in a strong neural activity in the auditory areas, and therefore might not be suitable for investigating auditory processing. However, other modalities of TBS, such as intermittent or intermediate TBS could be applied with an appropriately long TR 20. Continuous TBS has the theoretical potential of conferring a higher risk of seizure than other repetitive TMS protocols because it delivers high-frequency bursts (50Hz) and should therefore be used with caution 33. A physician or nurse who has experience with rTMS and is skilled in the management of seizures should be within reach from the rTMS laboratory whenever a participant is being studied. One case of seizure using cTBS has been reported in a healthy man with no risk factors for epilepsy 34 where they used a higher intensity (i.e. 100% resting motor threshold) than in the original protocol 20 (i.e. 80% active motor threshold). The procedure to follow in case of a seizure is described in the safety guidelines 35,36. When TMS is applied inside the MR scanner room, it is crucial that all the tools used inside the scanner be MR compatible. Here, the multi-jointed arm (custom-built) to mount the TMS coil was MR compatible (made with Acetal and polycarbonate), and fit within the MR bed specifications. The multi-jointed arm is particularly useful for long periods of stimulation and provides flexible positioning of the coil, and enables rotation in multiple directions. The trackers (Brainsight) used for positioning and tracking are MR compatible. The infrared camera (Polaris) is inside the MR scanner room but kept at a safe distance from the MR scanner (at least two meters from the scanner bed). Here no shielding of the infrared camera is needed, as at this distance, the magnetic field is 0.3 mT (3 Gauss) (personal communication with engineer from Siemens, 37,38), which is smaller than a refrigerator magnet (50 Gauss). Regarding the TMS stimulator system, we used a portable device, which is set up in an observation suite next door to the scanner. The first cTBS study in humans was by Huang et al.20 who applied bursts of 3 pulses at 50Hz, repeated at 5Hz over the primary motor cortex, at 80% active motor threshold. Here, because we used cTBS to target Heschl's gyrus, we reasoned that using the active motor threshold as a reference measure may not be a good indicator of excitability of this brain area. In addition, we used cTBS inside the MR environment, and this setup effectively reduces output intensities by approximately 20% (see previous sections). As a reference, the study of Bestmann et al. 39 using a similar set-up (i.e. Magstim system with an MR compatible TMS coil) reported a mean intensity of stimulation of 42% maximum stimulator output in 12 participants corresponding to 70% individual active motor threshold. Here, we used 41% of stimulator output, which is therefore comparable to previous cTBS studies and fits within the safety guidelines for cTBS use, see Oberman et al. 40 for review. It has also to be noted that several physical mechanisms of interaction between biologic tissues and static magnetic fields could theoretically lead to alteration of physiological or biochemical processes 37. However, several studies have been published reporting that these effects are below the threshold of significance 38,41,42. In addition, in our study TMS was carried out off-line, when the participant was lying down on the scanner bed and outside of the bore of the MR scanner. In this case, the main magnetic environment consists of the static magnetic field B0 which decreases with distance from the magnet; at the participant's distance, the strength of the magnetic field is around 3mT (= 3 gauss, or about ten times the strength of the earth's magnetic field) 37,43. Combined rTMS and fMRI techniques provide quantitative means of assessing TMS-induced changes in behavior and the underlying brain activity. TMS itself enables to parse behavior in time, but there is increasing realization in the literature that interpretation of the results is not as straightforward as originally thought 4,44,45. The main reason is that TMS induces changes in neural activity in the stimulated area, but also in remote areas from the stimulated site, and a change in behavior cannot provide information regarding the underlying changes in functional activity and connectivity. Therefore in our study, fMRI was carried before and after TMS. We showed that continuous theta burst stimulation applied over the right Heschl's gyrus induced an increase in fMRI response in the homologous areas in the contralateral hemisphere. This finding is in line with previous studies on visual or language processing showing a role of the homologous areas in the contralateral hemisphere after TMS-induced interference 10,13,46,47. Whether such interhemispheric interactions are compensatory to preserve function, or result from short term-plasticity is not well understood and further research is needed to understand the nature of such mechanisms. Combined TMS and off-line fMRI open new perspectives to investigate functional activation patterns and connectivity in auditory neural networks and is also particularly useful to evaluate possible reorganization or cortical plasticity. In addition, this combination could be also used to evaluate and assess long-term clinical follow-up in audiological, neurological or psychiatric disorders. CIBC fellowship (JA) and NSERC grant (RZ). We are grateful to Roch M. Comeau (Brainsight) for his help regarding the infrared camera, the MR compatible trackers and other hardware support. We are also grateful to Brian Hynes (Hybex Innovations Inc.) who designed the multi-jointed arm for coil holder and provided some of the figures displayed in the video. And a special thanks to all the MR technicians and M. Ferreira from the McConnell Brain Imaging Centre of the Montreal Neurological Institute who helped us optimizing the design of the experiment. Winer, J. A., Schreiner, C. E. The Auditory Cortex. (2011). Andoh, J., Zatorre, R. J. Interhemispheric Connectivity Influences the Degree of Modulation of TMS-Induced Effects during Auditory Processing. Frontiers in psychology. 2, 161 (2011). Siebner, H. R., Hartwigsen, G., Kassuba, T., Rothwell, J. C. How does transcranial magnetic stimulation modify neuronal activity in the brain? Implications for studies of cognition. Cortex. 45, 1035-1042 (2009). Ruff, C. C., Driver, J., Bestmann, S. Combining TMS and fMRI: from 'virtual lesions' to functional-network accounts of cognition. Cortex; a journal devoted to the study of the nervous system and behavior. 45, 1043-1049 (2009). Bestmann, S. Mapping causal interregional influences with concurrent TMS-fMRI. Exp. Brain Res. 191, 383-402 (2008). Bohning, D. E. BOLD-fMRI response to single-pulse transcranial magnetic stimulation (TMS. Journal of magnetic resonance imaging : JMRI. 11, 569-574 (2000). de Vries, P. M. Changes in cerebral activations during movement execution and imagery after parietal cortex TMS interleaved with 3T MRI. Brain research. 1285, 58-68 (2009). Cardenas-Morales, L., Gron, G., Kammer, T. Exploring the after-effects of theta burst magnetic stimulation on the human motor cortex: a functional imaging study. Human brain mapping. 32, 1948-1960 (2011). Grefkes, C. Modulating cortical connectivity in stroke patients by rTMS assessed with fMRI and dynamic causal modeling. NeuroImage. 50, 233-242 (2010). O'shea, J., Johansen-Berg, H., Trief, D., Gobel, S., Rushworth, M. F. S. Functionally specific in human premotor reorganization cortex. Neuron. 54, 479-490 (2007). Pleger, B. Repetitive transcranial magnetic stimulation-induced changes in sensorimotor coupling parallel improvements of somatosensation in humans. The Journal of neuroscience : the official journal of the Society for Neuroscience. 26, 1945-1952 (2006). Tegenthoff, M. Improvement of tactile discrimination performance and enlargement of cortical somatosensory maps after 5 Hz rTMS. Plos Biology. 3, 2031-2040 (2005). Andoh, J., Paus, T. Combining functional neuroimaging with off-line brain stimulation: modulation of task-related activity in language areas. Journal of cognitive neuroscience. 23, 349-361 (2011). 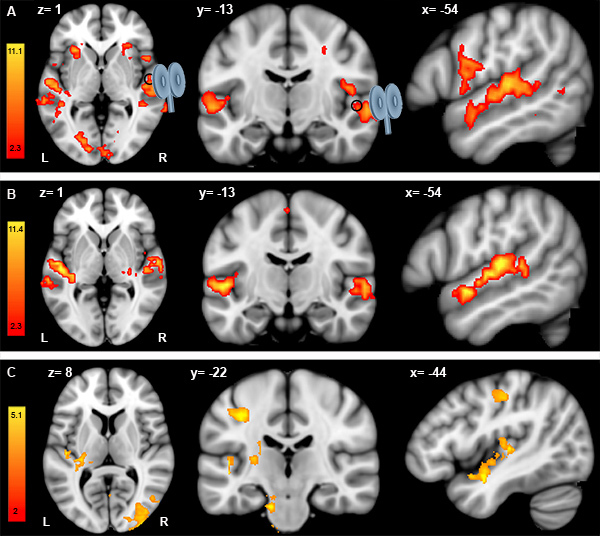 Belin, P., Zatorre, R. J., Hoge, R., Evans, A. C., Pike, B. Event-related fMRI of the auditory cortex. Neuroimage. 10, 417-429 (1999). Hall, D. A. "Sparse" temporal sampling in auditory fMRI. Human Brain Mapping. 7, 213-223 (1999). Foster, N. E., Zatorre, R. J. A role for the intraparietal sulcus in transforming musical pitch information. Cereb Cortex. 20, 1350-1359 (2010). Bohning, D. E. Mapping transcranial magnetic stimulation (TMS) fields in vivo with MRI. Neuroreport. 8, 2535-2538 (1997). Corthout, E., Uttl, B., Walsh, V., Hallett, M., Cowey, A. Timing of activity in early visual cortex as revealed by transcranial magnetic stimulation. Neuroreport. 10, 2631-2634 (1999). Lewald, J., Foltys, H., Topper, R. Role of the posterior parietal cortex in spatial hearing. The Journal of neuroscience : the official journal of the Society for Neuroscience. 22, RC207 (2002). Huang, Y. Z., Edwards, M. J., Rounis, E., Bhatia, K. P., Rothwell, J. C. Theta burst stimulation of the human motor cortex. Neuron. 45, 201-206 (2005). Loubinoux, I. Within-session and between-session reproducibility of cerebral sensorimotor activation: a test--retest effect evidenced with functional magnetic resonance imaging. Journal of cerebral blood flow and metabolism : official journal of the International Society of Cerebral Blood Flow and Metabolism. 21, 592-607 (2001). Lisanby, S. H., Gutman, D., Luber, B., Schroeder, C., Sackeim, H. A. Sham TMS: intracerebral measurement of the induced electrical field and the induction of motor-evoked potentials. Biological psychiatry. 49, 460-463 (2001). Loo, C. K. Transcranial magnetic stimulation (TMS) in controlled treatment studies: are some "sham" forms active. Biological psychiatry. 47, 325-331 (2000). Robertson, E. M., Theoret, H., Pascual-Leone, A. Studies in cognition: the problems solved and created by transcranial magnetic stimulation. J. Cogn. Neurosci. 15, 948-960 (2003). Puschmann, S., Uppenkamp, S., Kollmeier, B., Thiel, C. M. Dichotic pitch activates pitch processing centre in Heschl's gyrus. NeuroImage. 49, 1641-1649 (2010). Johnsrude, I. S., Penhune, V. B., Zatorre, R. J. Functional specificity in the right human auditory cortex for perceiving pitch direction. Brain : a journal of neurology. 123, 155-163 (2000). Di Lazzaro, V. The physiological basis of the effects of intermittent theta burst stimulation of the human motor cortex. The Journal of physiology. 586, 3871-3879 (2008). Stagg, C. J. Neurochemical effects of theta burst stimulation as assessed by magnetic resonance spectroscopy. Journal of neurophysiology. 101, 2872-2877 (2009). Todd, G., Flavel, S. C., Ridding, M. C. Priming theta-burst repetitive transcranial magnetic stimulation with low- and high-frequency stimulation. Experimental brain research. Experimentelle Hirnforschung. Experimentation cerebrale. 195, 307-315 (2009). Bestmann, S., Baudewig, J., Siebner, H. R., Rothwell, J. C., Frahm, J. Subthreshold high-frequency TMS of human primary motor cortex modulates interconnected frontal motor areas as detected by interleaved fMRI-TMS. Neuroimage. 20, 1685-1696 (2003). Bungert, A. TMS combined with fMRI. University of Nottingham. (2010). Bestmann, S., Baudewig, J., Frahm, J. On the synchronization of transcranial magnetic stimulation and functional echo-planar imaging. Journal of magnetic resonance imaging : JMRI. 17, 309-316 (2003). Wassermann, E. M. Use and safety of a new repetitive transcranial magnetic stimulator. Electroencephalogr. Clin. Neurophysiol. 101, 412-417 (1996). Oberman, L. M., Pascual-Leone, A. Report of seizure induced by continuous theta burst stimulation. Brain stimulation. 2, 246-247 (2009). Rossi, S., Hallett, M., Rossini, P. M., Pascual-Leone, A. Safety, ethical considerations, and application guidelines for the use of transcranial magnetic stimulation in clinical practice and research. Clin. Neurophysiol. 120, 2008-2039 (2009). Wassermann, E. M. Risk and safety of repetitive transcranial magnetic stimulation: report and suggested guidelines from the International Workshop on the Safety of Repetitive Transcranial Magnetic Stimulation, June 5-7, 1996. Electroencephalography and clinical neurophysiology. 1-16 (1998). Safety Guidelines for Magnetic Resonance Imaging Equipment in Clinical Use. Available from: http://www.mhra.gov.uk/Publications/Safetyguidance/DeviceBulletins/CON2033018 (2007). Yamaguchi-Sekino, S., Sekino, M., Ueno, S. Biological effects of electromagnetic fields and recently updated safety guidelines for strong static magnetic fields. Magn. Reson. Med. Sci. 10, 1-10 (2011). Bestmann, S. Mapping causal interregional influences with concurrent TMS-fMRI. Experimental brain research. Experimentelle Hirnforschung. Experimentation cerebrale. 191, 383-402 (2008). Oberman, L., Edwards, D., Eldaief, M., Pascual-Leone, A. Safety of theta burst transcranial magnetic stimulation: a systematic review of the literature. Journal of clinical neurophysiology: official publication of the American Electroencephalographic Society. 28, 67-74 (2011). Kangarlu, A. Cognitive, cardiac, and physiological safety studies in ultra high field magnetic resonance imaging. Magn. Reson. Imaging. 17, 1407-1416 (1999). Schenck, J. F. Safety of strong, static magnetic fields. Journal of magnetic resonance imaging : JMRI. 12, 2-19 (2000). Lee, V. S. Cardiovascular MRI: physical principles to practical protocols. Lippincott Williams & Wilkins, Philadelphia. 175 (2006). Paus, T. Transcranial magnetic stimulation during positron emission tomography: a new method for studying connectivity of the human cerebral cortex. The Journal of neuroscience: the official journal of the Society for Neuroscience. 17, 3178-3184 (1997). Sack, A. T., Linden, D. E. Combining transcranial magnetic stimulation and functional imaging in cognitive brain research: possibilities and limitations. Brain Res. Brain Res. Rev. 43, 41-56 (2003). Ilmoniemi, R. J. Neuronal responses to magnetic stimulation reveal cortical reactivity and connectivity. Neuroreport. 8, 3537-3540 (1997). Thiel, A. From the left to the right: How the brain compensates progressive loss of language function. Brain Lang. 98, 57-65 (2006).